Tonight, I finally got around to playing with them, because I hit a point where not using them would get ugly. I'm working on a demo project for a a talk that involves making a project that should (A) be part of a website, (B) should be reused by many websites. So I want this project to be a subfolder of my website, but I also want to be able to not duplicate repositories. Looks like a logical use of Git submodules,which I knew allowed having a remote repository appear as part of another repository. Here's some Hello World testing (caveat lector!) which should give a feel for how these work. So, first I created a directory c:\git-testing, and created two repos inside it, "repo1" and "repo2". I added a couple of files to each and made an initial commit for both. Now I decided to make repo2 a submodule of repo1. It just lists the existence of the submodule, where it is found, and what it points back to. Notice there is no mention of branch or commit. 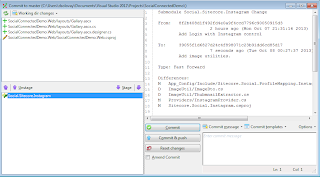 This file just forms the linkage, it does not manage the state of the submodule. You can add these two "files" and commit them, so that both repo1 and repo1/repo2 are up to date with no uncommitted work. Interesting! As far as "repo1" is concerned, repo2 is simply a file whose contents have changed form listing one commit to listing another. And there you have it. repo1 knows it has a submodule, and knows what commit it is at. And change in commit in the submodule shows as an uncommitted change in the containing repo. It's nice that the pointer doesn't refer to a branch, just a commit. So you can play with branches in the submodule with the freedom you normally have in git. All the parent folder cares about is what commit the child is at, not whether this commmit is called "master", or whether it is up to date with the source. One neat thing you can do with submodules is rebase your own changes on top of what's happening remotely. Suppose you wanted to apply your own changes on top of JQUery. 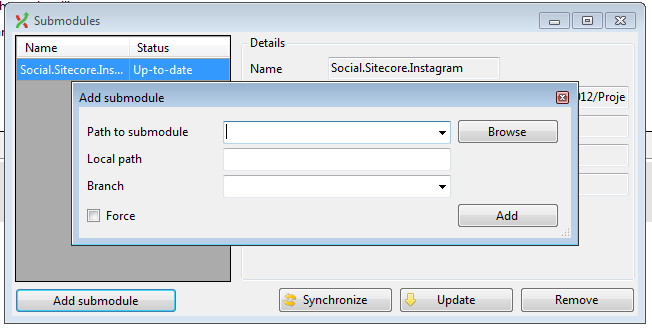 Create a submodule, make and commit your changes. Then when you want to pull in work done by the JQuery team, you can do a pull with rebase to keep your own stuff on top of theirs. Standard issue git magic, but now you are doing this in a sub-directory of another project. Sweet! Wanna know more? This got me started: http://git-scm.com/book/en/Git-Tools-Submodules Also see the Git-Extensions manual on submodules. I haven't started working with the Git-Extensions view on this, but I suspect it will be awesome, because they represent submodules with a little Beatles-esque yellow submarine. So, it's the next day, and I've started using this in Git Extensions. I've got my Instagram connector project, I'm working on, and I want it to be its own repo (because it's destined someday for Github), but I also want it to be a subproject in a demo site. So what does this look like? Git Extensions has a Submodule menu which allows you to link to a project (using a file path or URL) and select a branch. So setting up the submodule is pretty straightforward. But how do you make commits in two separate repositories? It's pretty simple, actually. If there are uncommitted changes in the submodule, these are indicated with a submarine with a red exclamation in the commit window. 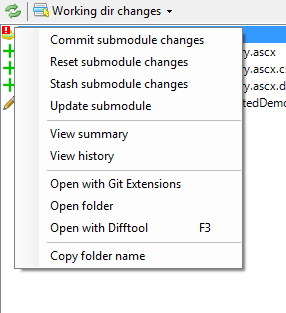 Clicking on this opens a commit window to the submodule. Once you are done committing to the submodule, you have to commit the directory pointer in the parent project to refer to the updated commit. This commit window shows the special icon for the submodule. 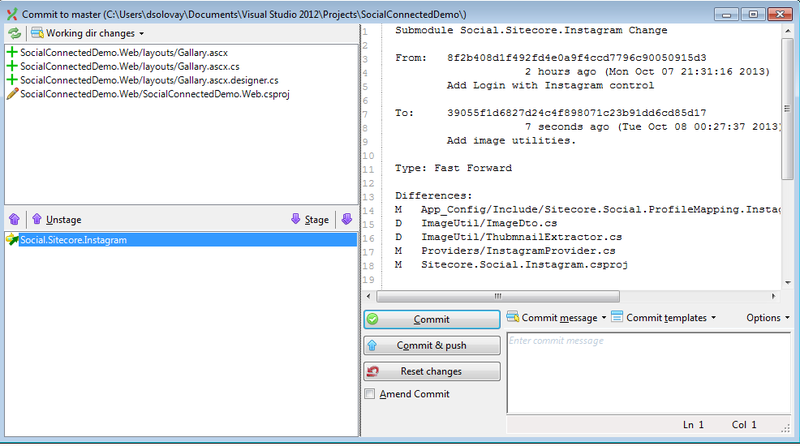 and the Diff window shows the change in referenced commits, with the commit message for each and the file change list. The workflow is reasonably intuitive once you play around with it. @DanSolovay yes we still use them for that sort of thing. They are really powerful but easy to screw up. A git nerd's tool. Some folks I work with usually just commit all marked changes, so I've had to fix submodule revision updates a lot, to the point where I'd send emails specifically requesting that folks run submodule update when I updated a revision on a submodule.